Laboratory extraction arms from Envirox provide ideal dust extraction solutions for assembly stations and laboratories. Our range of bench top extraction arms caters for ESD– and EX-rated environments, as well as highly corrosive or hazardous gasesor solvents. 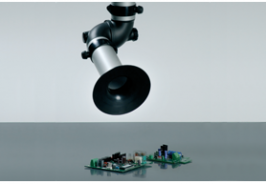 Available laboratory extraction arms include smaller units for light applications to heavier-duty extraction arms suitable for heavier dust and larger particles and fumes. In addition to offering a highly efficient and effective dust extractor, our range of Nederman extraction systems for laboratories feature low pressure drop arms and with low noise levels. Electronics assembly / soldering; museums / archives; laboratories; dental laboratories; operating rooms; goldsmith / jewellers; school chemistry laboratories; manicurists / pedicurists; prosthesis production; and mechanical workshops. These extraction arms are available as standard, ready-to-use units, or they can be ordered by part to build a completely customised dust extraction solution for your workspace. 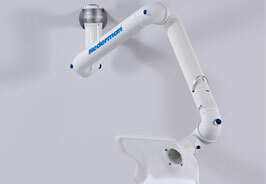 Ensuring you get the most appropriate arm handling solution, the extraction arms can be mounted as standing, hanging or attached to a wall. 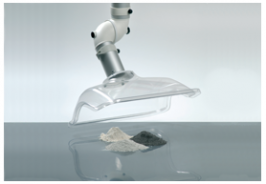 Our range of laboratory extraction arms provide desktop solution for dust extraction and laboratories.